Which Psilocybin Mushrooms Grow Wild in My Area ? Some authors refer to the bluing members of Panaeolus as Copelandia; therefore Panaeolus cyanescens is the same species as Copelandia cyanescens. Amanita muscaria can be found in all 50 states and in most countries. It is not a psilocybin mushroom so it does not appear in this list. *Note: It is important to know that the possession of psilocybin fungi is illegal in the United States, Canada, and many other countries. Possession can result in felony charges. Be careful. Edited by warriorsoul, 13 March 2014 - 12:02 AM. Thanks Hippie3. :bow: Perfect timing. or any other alkaoid containing mushroom in maryland i'm going to assateague by ocean city and was wonderin since last year my freind said they seen mushrooms growing off of wild pony manure on the beach. I live in British Columbia, and I have only found a couple of types, Liberty caps, And Psilocybe cubensis in my friends back yard but i think this is be cause my friend is dumping the spent bins in the garden they come back every year, I think its because we have mild winters. you're finding cubensis in BC? ...from 'spent bins' or otherwise, i'm surprised. This past year these species have been found.. Michigan - Psilocybe quebecensis, Connecticut - Psilocybe ovoideocystidiata and in New Jersey Psilocybe caerulipes. Mycologist Gary Lincolf told me Psilocybe baeocystis has been found in Connecticut. Also, Psilocybe plutonia was found in North Carolina last year. From personal experience I have found that the Blue Meanies are dominately a happy fun euforia trip. The gold caps were much more plentiful so I have done them more, I have had many open eye hallucinations and seen many pattens and think deep and quickly with the gold caps. I just noticed it for the first time today and noticed the Netherlands being a redundant entry (Holland & the Netherlands). But in this list, Holland has more species compared to the Netherlands which suggests to me that Holland is the collection of the Netherlands and some historic Dutch colonies. Interesting, I will try to find some time to check on this. The above list here was actually copies from three separate papers written by Me, Guzman and Gartz, and then others have added what they think grows in their areas. The problem with others adding shrooms to the list is that all of the original species described as the list are verified by herbarioum deposited collections, not what joe the plumpber found in his back yard. 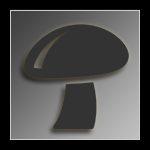 Many people here and at other sites identify mushrooms incorrectly as other shrooms with no mycological background to veryify that they know what they are talking about. and I have nopt upgraded it because a new list listing all the chemically analyses species form herbarium collections and on deposit at universitys around the world is being ready for publication in issue 1 or 2 of the New Psychedelic Salon Quarterly. And many species have been removed due tot he fact that they were species that were aidentified as active due to false positive chemical analysis and/or due to old papers form the early 1960s where a species was listed as possibly active, poisonous or jhallucinogenic. species such as P. coprophila, panaeolina foenisecii because one guide would list it as possibly active in some collections and then other field guides published the same errors in their newer books. Mistakes also like in David arora's Mushrooms Dymistified where they show a picture of Psilocybe cyanofibrillosa and list it as Psilocybe cyanescens. Panaeolus sphintrinus which is not active but was listed originally byu Schultes, and Ola'h as latent psilocybian. Later Schultes added it to his book Plants of the Gods and then in private communications to me came to the conclusion that it is not active and has never been used in Mexico as a neurotropic species, yet, Christian Ratsch, co-author on the new edition of Schultes and Hofmann;s plants of the gods, left that species in the book as a psychoactive species used by the Mazatecs and it is not active and never has been used. So when joe the shroomer picks a mushroom in Georgia and claimes it is P. weilii, it might also be P. caerulescens which is also known to occur in Georgia, Florida,, Alabama, Louisana and Mississippi. And they macroscopically resemble one another. many people here post pictures of Psathyrella species and ask if they are liberty caps and sometimes other members say yes, and they are not. SO I am sorry that others have fouled up a polically correct list of species with a lot of non-active species included or misidentified species in it. Holland should have been listed as The Nederland, rather than Holland. and now there are actually over 200 species with psilocybin and about 30 other mushrooms with chemicals other than tryptamine alkaloids. The additions i suggested are based on microscopy done by Workman. You are making the same mistake that Paul Stamets likes to make wrt P. cyanofibrillosa. The mushrooms pictured in Mushrooms Demystified are Psilocybe cyanofriscosa. P. cyanofibrillosa is a much thinner mushroom with a more pointy cap. About fifteen people ambushed Paul Stamets at the Oakland fungus fair a couple years back for making that mistake. Paul ran back inside, then came back ten minutes later to face the angry crowd and admit that he didn't do any microscopy on the specimens in question. The above list here was actually copies from three separate papers written by Me, Guzman and Gartz, and then others have added what they think grows in their areas. A lot of it also comes from Psilocybin Mushrooms of the World. The problem with others adding shrooms to the list is that all of the original species described as the list are verified by herbarioum deposited collections, not what joe the plumpber found in his back yard. What makes you think that the material in the herbariums was identified correctly? The people making these deposits are not magic mushroom experts and they don't always sit there for hours with a microscope and key every time they make a deposit. Panaeolus sphintrinus which is not active but was listed originally byu Schultes, and Ola'h as latent psilocybian. That species is not in this list. Geez, don't take my microscopy as gospel. I make mistakes all the time. I'm just fumbling through and making the best matches with existing descriptions as I can. Look at the Panaeolus tropicalis and Psilocybe atlantis mistakes. Those are still haunting me. Not to mention the Michigan sample that I thought was Psilocybe caerulipes instead of Psilocybe quebecensis. But I am pretty sure that these are Psilocybe atlantis and not that other Georgian species that I was told was Psilocybe atlantis and turned out to be something the same as or close to Psilocybe galindoi. You are probably not aware that I have serious arthritis in both of my hands and my vision is failing very badly due to my diabetes. I know how to spell but my vision, even with my glasses is hard for me to read. I told both Paul Stamets and David Arora about that error at a lecture I presented at Breittenbish Annual Shroom Conference and both said that the cost of correcting the error could not be done at due to the cost and that was the same year Arora published the book. And you are right. It was P. cyanofriscosa. 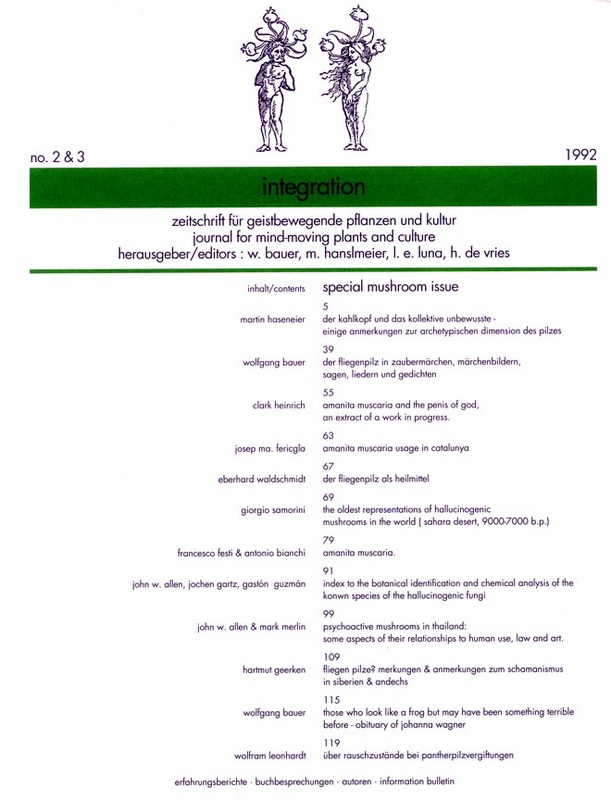 I gave Guzman a collection from Seattle in 1986 And I also preented specimens at Breittenbush in the mid 1980s and in the 1990s and with Gartz when we lectured there together and when Tjakko Stijve and I lectured there and also when I presented a lecture in 2001 or 2002. Allen, John W., Gartz, Jochen and Gastón Guzmán. 1992. Index of the known species of the hallucinogenic fungi. Integration: The Journal for Mind Moving Plants and Culture vol. 2-3:91-97. An Index of the existing literature provides both botanical and chemical references for more than 138 species of mushrooms producing psilocybin and psilocin. See (Guzmán, Allen & Gartz, 2000) for an up-dated listing of 214 entheogenic mushrooms. That reference is cited in Paul's, "Psilocybin Mushrooms of the World" on page 218 and Paul cited five papers by me and used three photos of Copelandia species by me. I am sorry but I cannot post his letters of communication to me regarding the book, my paper and my photos. and the Reference page 218 from Paul's, "Psilocybine Mushrooms of the World" citing my first list of species, all from actual verified collections of species that were botanically correctly identified and the chemical analysis of many of the species, verifying their psychoactivity. Others in the paper were from the original mycological published descriptions naming many of the species and indicating only those with intense bluing reactions. Also another error in Paul's book that I brought to his attention was his critique on his page regarding P. caerulipes as never having been analyzed for chemical content when: Paul wrote on page 105,"Moderately active. No analysis published." When in fact, Paul was unaware of this publication of the analysis of P. caerulipes. Leung, A. Y., Smith, Alexander H., and A. G. Paul. 1965. Production of psilocybin in Psilocybe baeocystis saprophytic culture. Journal of Pharmaceutical Science vol. 54:1576-1579. Carpophores of 6 species are analyzed for indole derivatives. Three species, Psilocybe baeocystis, Psilocybe caerulipes, and Psilocybe strictipes were found to contain psilocybin; psilocin was detected in the former two species. Three other species, Psilocybe atrobrunnea, Stropharia aeruginosa, and Stropharia semiglobata were void of indole content. TLC data for 36 indole derivatives in 5 solvent systems are included in this study. I also had pointed out to him numerous errors in his Mushroom Cultivation book used all over the world for edibles and the others, and again it was the cost of changing the masters and acetates use in printing the book that Paul said that it was to much money to spend for him to be able to correct the errors. why was Paul Stamets attacked in Oakland? Did a mistake he made lead to someone eating "bad" shrooms? sorry if this is rrepetitive but I dont quite understand the situation that went down in oakland. I live in the PNW in Seattle. I have no idea what occurred with Paul in the bay area, but as I mentioned, II collected the cyanofriscosa's in Seattle int he early to mid 1980-s, aking a herbarium deposit of them and have brought that species to Breittenbush shroom conferences on at leat 4-5 ocassions. Some in California also refer to it as P. cyanofriscana. However the mushroom is as yet unamed. I am currently in the process in the next 4-5 days of having the DNA of the species. I will discuss that at a later matter. Part of Paul's situation is that he has spent most of the last 25 years lecturing and his weekly shroom growing workshops he conducts in Shelton, Washington, so he has not spent the time in field identifications the way he did before "Psilocybe Mushrooms and their Allies" was published in 1978. and "Psilocybin Mushrooms of the World" in 1996. I also sold the first 100 copies of his first book for him at the Hallucinogens and Shamanism in Native American Life Conference at the Japan Trade Center in the fall of 1978. And in Amsterdam in 1998 at the Psychoactivity Conference he introduced me to the audience as the man who picked more mushrooms than anyone he had ever met. I presented a lecture and slide presentationon mushroom art throughout the ages at the Conscious Dreams Collective Kokopeli in the Red Light District attended by Ott, Stamets, Shulgin, Hofmann, Stijve, Gartz and others, including Arno Adaalars (author of Dutch shroom field guide and Ecstasy book) and Hans van den Hurk, the first to legally sell shrooms in shops in the Nederlands who owns about 7 smart shops. Actually I just caught another error by Paul Stamets in regards to his use of my paper from Integration volume 2 and 3. 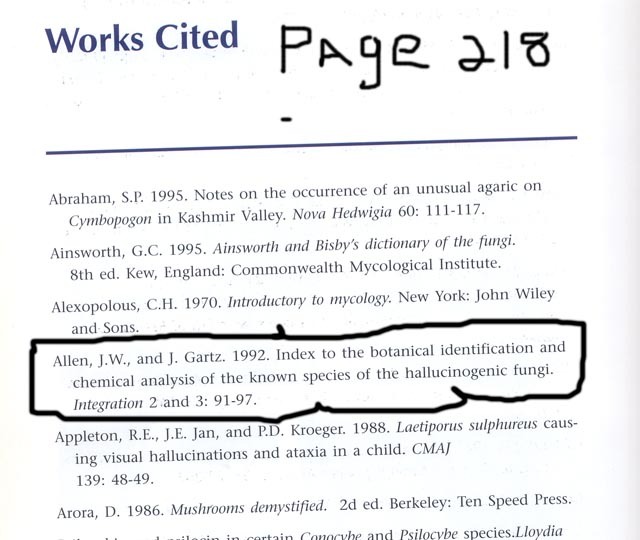 He forgot that Gaston Guzman was the third author of the paper yet he cited the reference in his field guide on page 218 as Allen and Gartz, 1992. And completely omitted Gaston Guzman's name. I never noticed that one myself until I just saw it a minute ago after looking at the reference on the cover. It is so funny because when I scanned the Stamets page to post it above, I circled the author-date citation and article and journal data and did not notice that Dr. Guzman's name was missing from the reference. As I said, there are many errors in his book and that is Paul's problem, not mind. I did mentioned several errors in the late 1990s to him and if he feels they are not important enought to correct, well that just reflects on his book. I have had errors in some of my publications also. My large paper I wrote on Magic Mushrooms of Australia and New Zealand had two species listed in the article in the Journal of Psychoactive Drugs that do not grow at all in Auystralia or New Zealand. 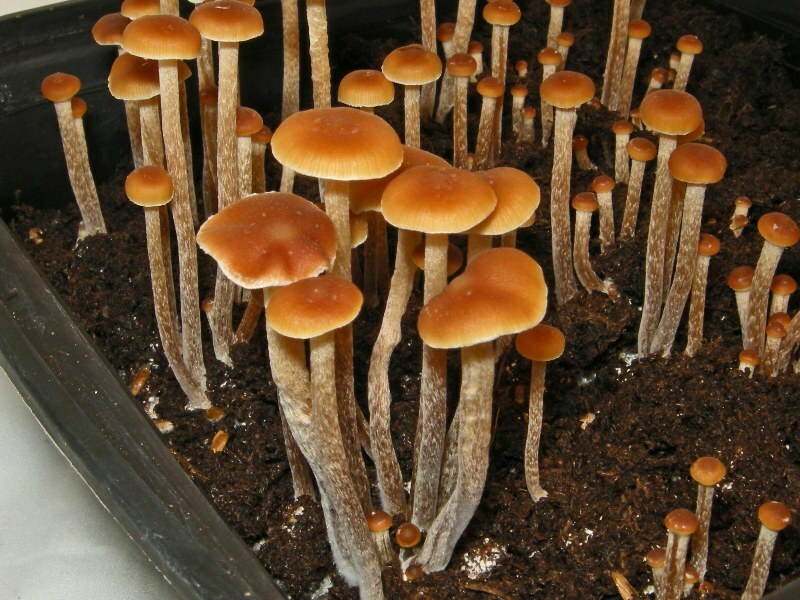 One was the mention of Psilocybe cyanescens in Australia which was analyzed for tryptamine content. The error came from Margot and Watling (1981) article on chemical analysis of new species, P. subaeruginascens, P. eucalypta, and P. australiana, with that of P. cyanescens (Margot, P. and Roy Watling. 1981. Studies in Australian Agarics and Boletes II. Further studies in Psilocybe. Transactions of the British Mycological Society vol 76(3):485-489. June.). Problem was that the authors noted in small letters that the P. cyanescens specimens used for the analysis came from the UK and did not really occur in Australia. I had Erowid remove that error from their online book of my article. Another major mistake came from Dr. Karl L. R. Jansen who wrote of Copelandia cyanescens on the south island of New Zealand and liberty caps on the North Island of New Zealand. In 2007, a member of the Shroomery brought to my attention that he and his friends had never found any Copelandia cyanescens in New Zealand at all. So I wrote to six major Universities and colleges in New Zealand to their herbarium Departments and found that there has never been a single specimen or collection of C. cyanescens on deposit anywhere in New Zealand. So Due to the word of a scholar, who now teaches medicine at Oxford for the last 20 years or so and is author of a book on Ketamine, unintentionally gave me wrong information concerning the existence of that species in New Zealand. All of the Unniversities I had contacted eventually wrote me emails staing they hade no such collections in their herbariums and were totally unaware of the existence of C. cyanescens in new zealand. So it is easy to make mistakes. now at 12:27 am in the morn, my eyes are beginning to blur and I cannot read the text on the screen. Regarding the last comment by me in this thread and your comment is answered above in the same box as my response to Alan. My eyes are bleeding tears right now and feel like they are caked with grains of sand that are actually crystallized tears from my outer tear ducts that crystallized and became imbedded in my inner eyelids so I am tearing at the moment. Please read my replies to you and Alan about my post in the thread what shrooms grow in your area because Alan's comments to mine that the list came from my papers and Alan said much came from Stamets field guide, Psilocybin Mushrooms of the World." however, in the references cited on page 218, Paul cited my paper with me, Gartz and Guzman as a source used to cite locations for 136 species of psilocybian shrooms. But after posting it and replying to another members question about Alan's comments of an attack by San Francisco collectors about the cyanofriscosa error in David Arora's book, which I also touch on because I collected Seattle specimens in 1986 deposited with Guzman and subsequent collections I placed on display at the Breittenbush shroom conferences in the late 198-s, 1990s and early 2000, when I lectured on different years with both Gartz, Stijve, Ott, Arora and others. So today I noticed when I posted the reference page from Paul’s book, "Psilocybin Mushrooms of the World," that Paul for some reason had accidentally omitted Gaston Guzman from the reference and Guzman was third author on that particular paper. Paul also used another paper of mine that is noted in several letters of personal communication between Paul and myself during the time he was working on the book. In 1991 when I introduced Paul to Gartz and vice Versa, Gartz and I told Paul we were considering a book on shrooms of the world because I have a larger collection of species photos than he used in his book, only some of the photographers did not want their images in Paul's book. Also, Gartz and Stamets, behind my back, published the taxonomy and chemistry of P. azurescens. Even though Gartz gave me credit in the acknowledgments for the collections I helped him gather in Astoria and Hammond, Oregon when he paid me to take him shroom picking during the period of our forthcoming lecture in Breittenbush, Oregon. Gartz knew that the locals in Astoria and all of Oregon coastal region and Portland area referred to the mushrooms as Psilocybe astoriensis. Gartz not only published that paper behind my back in a German publication that I wrote three articles for, but he also sneaked a package of mushroom postcards he sold all over Europe with 12 of my photos listing only 5 as mine pictures out of 22 photos. He also sold a mushroom calendar with three of my photos in the calendar. Later he took my two cd-roms, that he was co-author on, one he only contributed 3 pages of text out of 1,000 pages, and changed the covers, putting his name first and mine as 2nd author. He thought I would never go to Europe and then see those postcards and calendars being sold all over the continent. Interestingly, He listed Paul Stamets as an editor of the calendar and when I asked Paul about it, Paul told me in an email and in person that he had no idea about the calendar until someone in Europe sent him a free copy. But UI have had some problems with both Paul and More so with lying Gartz. He also claimed to have sent two letters of mushroom specimens to Guzman last fall, one in September and one in October of a new species and Guzman tells me he never received any mail from anyone in Germany at all with mushrooms. Now it is possible that one letter could have been lost but not two. Gartz had legal problems in the later 1990s when the University of Leipzig where he works caught him selling cultures for cubes and copes to people in the Nederlands using the U of Leipzig as his source of shroom work. He almost lost his job. He wrote me last summer that he was no longer allowed to do any mushroom research on mushrooms which came from outside of Germany and later when he lied that he sent those new species to Guzman, he wrote me that he thought he was being watched, that the KGB still existed and watched people involved in drugs and he did not want to take a chance and lose his pension. And out of about 300 or more scholars I have corresponded to in the past 12 years, Gartz is the only person I know who has no email at all. I think the University told him he could not have an email, but Gartz says government can collect your email and use it against you. Another sneaky thing he did was I told him how to transfer Azure mulch and mycelia to grow it outside of Oregon, and noting that a crop will only grow for a couple of years and then when the nutrients from fertilizers are gone, the shrooms do not come back. He planted over 30 [patches in a 7 year period and today he has no azure patches anywhere and they never grew into newer areas near the places he made his transfers, then he published a short paper in German in the very same journal that Mark Merlin and I published out paper on Panaeolina foenisecii. Anyway I went off on a rant and need to give my eyes, one is only opened a break. check out my comments to you and Alan in that thread of what species grow in your area. Cactu sent at least a half dozen collections to Guzman, all were "lost in the mail." So maybe Gartz is telling the truth on that one. why was Paul Stamets attacked in Oakland? He referred to mushrooms that were Psilocybe cyanofriscosa as Psilocybe cyanofibrillosa, provoking an angry mob of hippies and taxonomists to quiz him on exactly what microscopic characteristics he observed that made him apply the cyanofibrillosa epithet.